Frank Dello Stritto on growing up in the 1950s and 1960s with TV re-runs and old movies. How pop culture branded a generation with...classic monsters. For every monster kid! Autographed by the author. 415 pages. Hard cover with jacket. Lots of photos from classic movies and illustrations. "Message From Moscow." Hardback - 210 Pages (1966) [Whitman] Used Book. CLICK IMAGE FOR DETAILS. Published by McFarland - By Tom Weaver. New Hardback Book - 314 Pages with photos. Packed with wonderful tidbits, this volume collects 22 interviews with moviemakers. CLICK IMAGE FOR DETAILS. Published by McFarland - By Don Glut. Softcover - 229 Pages with photos. This volume takes a firsthand look at the movie-making career of Don Glut. CLICK IMAGE FOR DETAILS. Note: Lots of cover wear, but book is intact and no loose pages etc. Rare book on Frankenstein in movies and pop culture. Hundreds of photos and magazine cover repros. Packed large of cover. Former library book. Rare! By John Stoker. Stage, films, pop culture, toys! Cool! The Frankenstein myth, or story, existed - the influences on Mary Wollstonecraft when she and the English poet Shelley had made their excursion down the Rhine. Fascinating history! And from Shelley to Hollywood with Karloff and England's Hammer films. Recommended - the history of Frankenstein! Full Scripts from the Crypt treatment: a lengthy "Making Of" essay, quotes from its writers and its producer-director, cast members memories, Production Code correspondence, a dissertation on the music, release information, pressbook and the ultra-rare script. By Tom Weaver! By Tom Weaver. Published by McFarland Press. Softback - 425 pages with photos. Lengthy, in-depth interviews feature canny questions, pointed observations, rare photos, and good fun. CLICK IMAGE FOR DETAILS. An amazing historical compilation of the lead-up to filming Universal's THE INVISIBLE MAN. Different writers attempts and different plots, stories and scrips (including John Huston). Most of the proposals had Karloff pegged as the lead. Colin Clive in one case was slated. Amazing film history! A classic Scholastic! 1963 version! Appears unread and unopened...only age tanning. Super nice condition. The great H.G. Wells novel, THE INVISIBLE MAN. Tight spine. A beauty. A classic Scholastic! The great H.G. Wells novel, THE INVISIBLE MAN. A neat cover design. Used but in great condition. A name in pen small in the inside front cover. Tight spine. Provocative stories of the weird and humorous involving invisibility! 1960 first edition Ballantine paperback. Great stories by Fletcher Pratt, L. Sprague de Camp, Ray Bradbury, H.G. Wells, Charles Beaumont, Theodore Sturgeon and more. 158 pages. Normal wear. The book of animals turned into men by a mad scientist. This is an interesting version as it's paperback book size, but is a hard cover. Condition: Former library, but it only has a stamp, no other cards or markings, just a stamp. Age tanning, but otherwise intact and nice. 1973 edition. The classic H.G. Wells novel of a mad doctor and the animals that he turns into beast-men. A stranded man stumbles onto the horrible secrets of Moreau. A 1950s edition paperback. Page yellowing. Used. Packed with photos of his work with special effects man Paul Blaisdell and current color photos of the most amazing movie prop collection in the world. 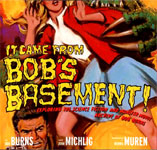 A story told with genuinely enthusiasm, Bob's Basement honors the beloved cult classics that have shaped movie history. Large softcover. By Tom Weaver. 386 Pages - with photos. This collection goes behind the scenes with 20 of the most talkative people of Hollywood?s horror, science fiction and serial films of the 1930s through 1960s. CLICK IMAGE FOR DETAILS. By Geoff Isaac and Gordon Reid. 220 Pages - with illustrations and photos. Pick your favorite horror or science fiction star and head to the kitchen with them! CLICK IMAGE FOR DETAILS. Arranged by English title, each entry includes Italian title, studio, running time, year of release, work the film is based on, and cast and credits. Plus lengthy essays, plot synopsis with critical commentary and behind-the-scenes information. Hardcover, gold inset title. Photos too.